At The Vancouver Exchange Lofts for Sale, History Repeats Itself. Built in 1913. Move in this Fall. Original brick, wood beams, AEG appliances, exposed concrete floors and Dada kitchens are now available at the False Creek Vancouver Exchange lofts and condominiums for sale. Built for you in 1913. There are very few heritage buildings in Vancouver real estate market, and there are even fewer that can house a modern conversion as well as Exchange Vancouver lofts for sale does. Design elements such as AEG appliances, DADA, stainless steel kitchen countertops, walnut cabinetry with touch-latches, exposed aggregate concrete floors all define an identity that is full of real character. YOU HAVE TO SEE IT! Visit the False Creek Vancouver Exchange lofts fully furnished and completed display suite. The Exchange Vancouver lofts for sale are located at #111 - 388 West 1st Avenue (at Wylie Street) and open on weekends 12-5PM, or by ppointment. For more information about the Exchange Vancouver condo development please contact us at 604.879.3200 or online at exchangeliving.com. See you soon! The Exchange Sales Team at #111 - 388 West 1st Avenue, Vancouver, BC | t. 604.879.3200 | f. 604.708.6463 | e. info@exchangeliving.com | w. exchangeliving.com. A heritage building finds new purpose and meaning, here at the completely new Vancouver Lofts for sale at the Exchange Lofts real estate development. There are very few heritage buildings in Vancouver, and there are even fewer that can house a modern conversion as well as Exchange Lofts in Vancouver does. A sense of history is centred in Southeast False Creek Vancouver North Cambie Village area. Living at the new Vancouver False creek Exchange Lofts for sale will place you in Vancouver’s newest, most vibrant neighbourhoods – Southeast False Creek – North Cambie Village! Leisure activities, shopping, restaurants – you have it all. To the north, take a stroll to the seawall. To the west, enjoy all that the Granville Island Public Market has to offer. To the south, a short walk will bring you to Cambie Street, Vancouver’s newest shopping centre neighbourhood, where you can enjoy its array of dining and shopping, just minute away from your new home at the False Creek Exchange Vancouver lofts for sale. Whole Foods, Home Depot, Canadian Tire, HomeSense/Winners, Save on Foods, Best Buy, City Square Shopping Centre and much more. A nice walk from home going East, will bring you to a brand new 22,000 sf Urban Fare, London Drugs, a newly restored Salt Building to dine, or explore the 30,000 sf Community Centre all slated to be available in 2010 for residents here at the presale Vancouver Exchange Lofts and condos in Southeast False Creek. Green Living at Exchange Vancouver condos: a wide range of transportation choices that promote more sustainable modes of travel have been encourage by Vancouver. In keeping with this vision, a Prius hybrid has been purchased (managed by the CAN Co-Op car program) for the exclusive use of Exchange Southeast False Creek residents. Or choose to walk, bike, run use the new troll train, Aqua Bus or the new Canada Line Olympic Village SkyTrain Station at West 2nd and Broadway. Your travel options are endless. An old district finds new purpose and meaning here at the new Vancouver Exchange Lofts and condos for sale. While maintaining the heritage ties to its past, Southeast False Creek Vancouver real estate district is being planned as a model sustainable community base don environmental, social and economic principles where people live, work, play and learn. A mixed use community with a focus on residential housing in Southeast False Creek Vancouver, all condo buildings will be designed to be healthy, livable, and efficient in their use of energy resources and water, such as at the new Exchange Lofts in Vancouver. The completed Southeast False Creek Exchange Lofts neighbourhood will offer an extensive array of amenities within walking distance, as well as housing and jobs linked to transit. If you are curious about how a 2010 home purchase would look like in a new condo development, click here for the New Home BC HST Tax Increase and HST Price Difference as shown in the BC HST Price Chart. Move In This Fall! Exchange Lofts Construction Update. Exchange Southeast False Creek lofts for sale is on schedule for completion this Fall 2009. The Vancouver Exchange loft finishings, painting, drywall, roof access staircases and roof canopy window installations are well underway in the Heritage building. Within the new Exchange lofts building the stud framing is well underway up to Level 5. Window installations are in progress up to Level 4 and roofing planters are nearly completed. There are sixty eight unique Southeast False creek Vancouver Exchange loft homes ready to move into this fall. Visi thte fully furnished and completed display suite at #111 – 388 West 1st Avenue, Vancouver. About the Developer: The PCI Group is a Vancouver based real estate development and management company. Since PCI’s inception in 1982, they have created a culture of innovation and integrity. PCI has assembled expertise, enabling them to successfully undertake both residential and commercial projects. 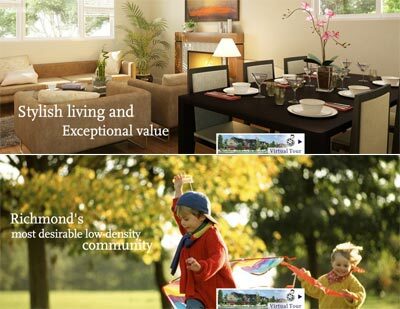 Richmond real estate’s best townhomes are now here! Grand opening of the pre-sale Richmond Townhomes at Kinsbridge McLennan property development is launching on August 8th, 2009. Kinsbridge Townhomes for sale – Beginnings of a New Tradition. Where quality and value merge. Stylish living and exceptional Richmond real estate value is found here at the new Kinsbridge townhouses now selling. Located in the quiet McLennan Richmond real estate community, Kinsbridge townhomes is Richmond’s most desirable low density community of two level new townhouses for sale. Spacious three and four bedroom Richmond floor plans give more space to every family, while exquisite finishings and well planned extras raise the bar to a new level of quality in the Richmond real estate market. The best Richmond Kinsbridge townhomes for sale features some of the most awesome finishes including: radiant floor heating throughout two levels of living as well as high efficiency condensing boiler and Low-E windows. Richmond homebuyers can also upgrade to a HRV ventilation system for optimal air circulation and health benefits. The pre-sale Richmond Kinsbridge townhome community consists of single detached, duplexes and triplexes for sale. The floor plans range between thirteen hundred and ninety to eighteen hundred and forty five square feet in size. To become a Kinsbridge Richmond VIP and be eligible for previews, please call Cofa or Kevin at 604.218.8810 or register at www.kinsbridge.com today. The pricing for these new Kinsbridge Richmond townhouses starts from an incredible price point of only $498,000. The grand opening is scheduled for August 8th, so hurry up so that you can get the best selection available. 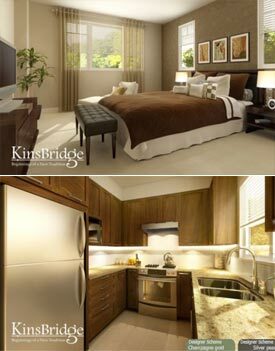 The Kinsbridge Richmond homes presentation centre is located at #110 – 9780 Cambie Road in Richmond, BC. Marketed by Multiple Realty Ltd and the project is by Jacken Investments Inc. All new Richmond homes sold will have the National Home Warranty. For details about how the new BC Harmonized Sales Tax 12% HST will affect your new home purchase next July 2010, please click here. Some of the great features of this new Richmond real estate project is not found anywhere else in the city. The Kinsbridge townhouse master plan will feature low density building sites that allow for a lot more space and privacy between your neighbours. In addition, the entire Kinsbridge Richmond property development will consist of a small collection of only 45 townhomes with triplexes, duplexes and even single detached Richmond homes for sale. All of the homes will have two levels of living space and will consist of either three or four bedrooms layout. The heritage inspired architecture and exterior Tudor style cables with custom wood trim give the new Kinsbridge Richmond townhome community a more established look and feel for its residents. There is an automated sprinkler irrigation system for all the lawns and yards in the neighbourhood in addition to industry leading durable HariPlank and vinyl siding, all covered by extended warranties. Homebuyers here at the pre-construction Richmond townhouses at Kinsbridge can also include an amenities area with wooden arbours and a kids playground on site. Some of the added features of these impressive and affordable Richmond homes for sale include an option Heat Recovery Ventilation System (also called HRV) that allows for fresh air circulation that is very quiet. What this allows homeowners at the Kinsbridge Richmond homes to do is have their house heated during the winters and cooled during the summers without having to open any windows whatsoever. In addition, the pre-construction Richmond Kinsbridge homes for sale will also have centralized vac rough-ins, automatic dust pan in the kitchen (kick-plate), low emittance windows for energy savings and in floor concrete radiant heating on both levels (very unique and expensive to integrate). The pre-construction Kinsbridge homes will also feature an industry first – a high efficiency condensing water boiler with efficiency rating of ninety per cent and above, which is unheard of in a development of this size. 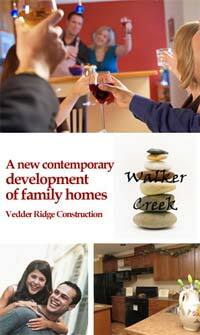 All Kinsbridge homes will come with the two-five-ten year National Home Waranty. In addition, the interiors will all have hard wired smoke detectors in addition to cabling throughout the home for TV cable, phone and internet lines. All homes at the Richmond Kinsbridge townhouses for sale will have security alarm pre-wired and secure side by side two car garages in addition to extra sound buffering between shared walls. The extraordinary bathrooms at Kinsbridge townhomes will include natural granite slab counters/undermount sinks in addition to powder rooms for convenience on the main level. In addition, the ensuites will have high end Kohler fixtures, solid wood shaker style maple cabinets, designer selected polished steel door pulls, and oversized Kohler soaker tub. There are anti slip ceramic tiled flooring and ceramic tiled shower and bath surrounds too. The gourmet kitchens at the pre-construction Richmond homes for sale at The Kinsbridge community will include a stainless steel appliance package including garburator, hand set ceramic tiled backsplash, Kohler single level faucet, custom built eight foot solid wood cabinets in maple, undermount double bowl sink and granite slab counters. All of the pre-sale Richmond Kinsbridge homes will have horizontal blinds for all windows, baseboards and door casings in addition to a linin cloest and European style front loading washer and dryer that are standard with each home. The pre-sell Richmond townhouses will also have in suite laundry facilities like a wash sink in some units in addition to wall to wall high end carpets in hallways and upper level bedrooms. Nine foot ceilings on the main level are standard as are laminate wood flooring in the dining and living rooms. The pre-sell Richmond Kinsbridge townhouses also feature two designer colour palettes for potential homebuyers to choose from including Silver Pearl and Champagne Gold. Both design themes are beautiful. The luxury Richmond conodminiums at Kinsbridge community are now launched. Located in Richmond real estate’s McLennan neighbourhood, the new KinsBridge condos is preparing for a full launch right now. These 45 luxury Richmond townhomes for sale are available in single family detached, duplex, and triplex floor plans all with generous and spacious rooms and floorplans. The luxury presale Kinsbridge Richmond townhouses’ state of the art heating and ventilation system with condensing boiler providing more than ninety per cent efficienty, concrete radiant floro heating on both levels and an optional HRV (heat recovery ventilation) system combine to maintain the most superior indoor air quality and lower energy costs for presale Kinsbridge Richmond townhouse residents. Information and priority registration for the new Richmond townhouses for sale is now available at kinsbridge.com or you can call 604.218.8810. 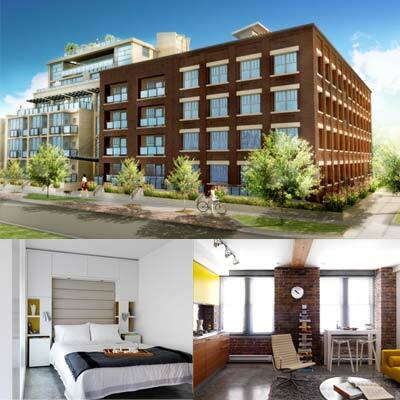 Downtown Vancouver Condo Project Update: Gastown Woodwards Condominium Residences Complete! Both W43 and W32 High-Rise Towers Finishing Summer 2009! BREAKING NEWS: The much anticipated Gastown Woodwards Condo District development is reaching completion! 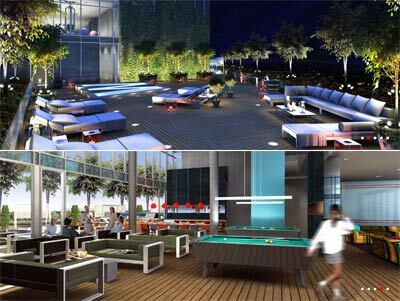 The W43 Woodwards condominiums will be completing between late July and mid August. The W32 Condos at Woodwards Gastown real estate development will be ready for occupancy shortly afterwords. Update from June 2009: The Gastown real estate redevelopment of Woodwards Condominium Tower Residences is perhaps the most significant mixed-use property development project to be undertaken in Vancouver downtown ever. 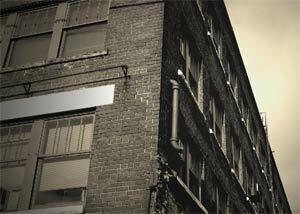 In a few short weeks you will bring Woodward's Gastown condo homes to life and become part of its community! After years of neglect and uncertainty over its future, the Woodward's Gastown real estate condominium redevelopment is now weeks from opening and the beginning of a new era for this historic Gastown site. The downtown Vancouver Woodward's redevelopment is approximately 1,000,000 square feet consisting of major retailers (London Drugs, Nesters and TD Bank), office space, 536 new Gastown homes for sale and 200 non-market downtown Vancouver condominium residential units. Simon Fraser University has demonstrated its enthusiasm for the community and their conviction to the project with their commitment to a 120,000 square feet SFU School for the Contemporary Arts. We are estimating completion for Woodwares tower W43 (128 W. Cordova St) to be in June 2009 and for Gastown Vancouver Woodwards tower W32 (108 W. Cordova St.) to be in July/August 2009. What you should look out for in the upcoming weeks are: Lawyer selection correspondence, walk-through scheduling, and Woodwards condo closing notices. If you have any questions regarding the purchase of your downtown Vancouver Woodward’s Gastown condo unit or need to update your contact information please do not hesitate to contact us at 604.682.2088. PUBLIC GETS FIRST PEEK INSIDE REDEVELOPED WOODWARD'S CONDO BUILDING (April 2, 2009 - The Vancouver Sun) "A Who's Who of politicians - including Premier Gordon Campbell and Mayor Gregor Robertson - turned out to heap praise on the Gastown condo real estate project and its developer, Ian Gillespie of Westbank...". WOODWARD'S GETS ITS WELCOME MAT READY (April 3, 2009 - The Globe and Mail) "Mayor Gregor Robertson said he expects the development to be "a huge benefit" to the Downtown Eastside. New Gastown housing, new businesses and better amenities such as a new daycare facility will create opportunities for those who live in the Woodwards condominium neighbourhood, he said...". DOWNTOWN WOODWARD'S ALMOST FINISHED (April 3, 2009 - The Vancouver Province) "It's more than I ever dreamed of and city planners from around the world will come to see how this works" said former Vancouver city councilor Jim Green, who had the vision for the development when the city brought the former iconic retail store and land from the province for half its cost in 2003. More details about the re-sale Gastown condos at Woodward's Vancouver real estate development is located here. 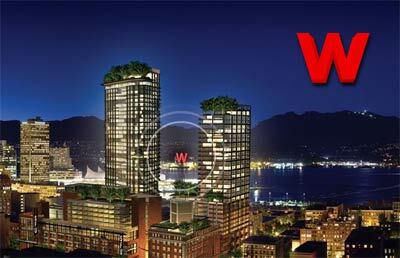 An update from the pre-construction Woodward's Condominium tower residences was sent to all purchasers for this presale Vancouver real estate development in December 2006. Here is a breakdown of the updates for Woodward's Vancouver. Be Bold or Move to Suburbia Now a branded statement. On the heels of demolition, the Woodward's project has quickly become the success story of Vancouver. Congratulations! You bought a piece of history – presale Woodward's signature address at the heart of an amazing urban renaissance. Nowhere else will you find such an inspired collection of creative and progressive artists, designers, investors, retailers, activists and intellectuals as pre-sales Woodward's Vancouver downtown real estate condo residences. Construction has officially started and it is happening right now as you read this. Rennie Marketing Systems is so proud to be a part of the Gastown Woodward's Redevelopment team and pleased to keep you up-to-date on progress in this truly integrated neighbourhood. A message from Bob Rennie of Rennie Marketing Systems on behalf of the entire Woodward's team. Selective demolition activity continues on the Woodwards Condo site. The remaining building shells, with the exception of the heritage building on the southeast corner of Abbott Street and Hastings Street, were carefully brought down on the morning of Saturday, September 30. Excavation on the pre-construction Gastown Woodward’s Condominium site in downtown Vancouver Gastown real estate district will begin in November and concrete pouring will begin in early December. Demolition and construction photos are available on the website at www.woodwardsdistrict.com. Drawing Board. Passion is in the details. It's very well known that the talented partners, staff and designers at Henriquez Partners Architects, under the guidance of Gregory Henriquez, have contributed greatly to Vancouver's urban environment and are particularly passionate about Woodward's and the surrounding community. Even before the Gastown redevelopment project was awarded at Vancouver's Woodward Gastown condo towers, they spent countless hours on drawings, from napkin sketches to computer renderings, all to ensure the proposed project was every bit as successful as it has turned out to be. Today there are 14 architects, three administrators, two partners and one associate working on the architectural drawings for the presales Woodward's Gastown condo construction. At well over 800 pages, the drawings are now nearing completion. By early 2007 they will be 100% complete and topping out at a whopping 1,000+ pages. In the past 6 months alone, this dedicated team has clocked over 25,000 hours on this very complex Woodward's Gastown condo high-rise project! Great location on the upper edge of Promontory, the pre-construction Chilliwack homes for sale at Walker Creek is a collection of only fifty two, three bedroom townhomes priced from $529,900. Set against a picturesque mountainside, these pre-sale Chilliwack Walker Creek townhomes feature designer kitchens with luxurious millwork, unfinished basements and expansive windows so you can savour the views across the valley floor. Showhome for the pre-construction Chilliwack Walker Creek townhomes is now open 1 to 4pm on weekends or by appointment and is located at 52 Hudson Road Chilliwack. For more information about the Promontory Chilliwack homes for sale, please visit www.vedderridgeconstruction.com/walkercreek or you can also call Jason at 604.991.8250. Beautifully crafted and landscaped homes at the Walker Creek Chilliwack townhomes are only starting from $254,900 plus GST, giving you both value and location. All new Promontory homes also come with the National Home Warranty and are brought to the Chilliwack real estate market by Vedder Ridge Construction, an established boutique builder in the Lower Mainland. Located on Promontory Chiliwack real estate district, the pre-sale Chilliwack Walker Creek townhouses are close to schools, recreational areas, parks, shopping and services, making the neighbourhood an ideal spot for families of all ages. Located within the Fraser Valley, they are only an hours drive to Vancouver and close to Harrison Hot Springs, Cultus Lake as well as the Chilliwack River for four season recreational activities such as fishing, hiking, golfing, skiing, snowmobiling, beachcoming and much more. Close to Prospera Centre and Twin Rinks in addition to playgrounds, greenery, parks, sports fields, community centres, walking/biking trails and swimming pools/tennis courts, the pre-construction Chilliwack homes for sale at Walker Creek community will become the most sought after new Promontory development this year with a great price point and spacious living floor plans. With a population over seventy thousand and a close proximity to major cities, the US border and much more, the Promontory Chilliwack real estate neighbourhood is also a great place to live, work and play. The exterior features of the Promontory Chilliwack real estate development at Walker Creek townhomes by Vedder Ridge Construction promotes sustainable and low maintenance living. Such features include greenbelts, fully landscaped yards and full driveways with parking at the front of the home sin addition to stylish vinyl siding and cultured stone or brick on the exteriors too. The pre-construction Chilliwack homes at Walker Creek Promontory townhouses will also have double garages with openers in addition to large energy efficient vinyl windows and the screens are also included with your home purchase. There is a thirty year warranty on the shingles too in addition to the National Home Warranty. A new contemporary development of family homes here at the pre-sale Walker Creek Townhomes in the Promontory Chilliwack real estate market also feaures impressive interiors that include quality flooring throughout with underlays under carpets, walk in closets in the master bedroom, large sumptuous master ensuites, rough in central vac system and security alarm system installed as well. Other interior features of the pre-construction Chilliwack homes for sale at Walker Creek townhomes include professional painting, heritage millwork and mouldings throughout, appliance package, natural gas fireplace with tiled surround and a large 50 gallon hot water tank in the basement. Other things of note here at the pre-construction Chilliwack real estate development at 46791 Hudson Road, Promontory Walker Creek townohmes include laundry closets on the upper floors for convenience, high efficienty forced air natural gas furnace in most units, tiled backsplash which is an upgrade) and upper kitchen cabinets as well. The gourmet chef inspired kitchens at Walker Creek townhomes also feature large islands in the kitchen, three bedrooms on the upper floor and eight different floor plans for homebuyers to choose from. Home buyers here at the Walker Creek Chilliwack homes for sale will also get to decide between two colour palettes that suit their lifestyle. With lots of windows, large entertainment areas, outdoor living spaces and dream kitchens, the Promontory Chilliwack Walker Creek homes for sale will not last long! Located at 46791 Hudson Road, Chilliwack, make sure you visit their sales centre today for more information about the new 52 townhouses for sale here at Walker Creek. The original phase of the Promontory Chilliwack real estate master-planned development by Vedder Ridge Construction was called the Cedar Springs townhomes for sale. 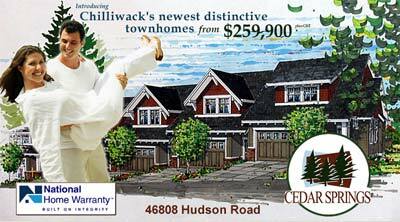 Introducing Chilliwack’s newest distinctive townhomes starting from just $259,900 plus GST. All of the homes were covered by the National Home Warranty as well. With many of the same high-end features and finishes as with Walker Creek Promontory townhomes, the Chilliwack Cedar Springs homes for sale also present the highest level in planning, design and construction, leaving you with a master piece and a spacious residence that you and your family can finally call home. With only seven Cedar Creek Chilliwack townhomes left for sale, you can now choose the one that best fits your lifestyle and your needs. Most of the floor plans introduce three level living, with three bedrooms on the top floor, the great room, kitchen, dining room on the main floor (with attached double garages) as well as the crawl space and a massive future rec room in the basement. Vedder Ridge Construction also allows pre-sale Chlliwack Cedar Springs townhome buyers to finish their basement with a 2 piece bathroom as well for only $18,000 plus GST. All units here are fully fenced and some homes back onto the creek with concrete rear patios and high efficiency windows and landscaped yards. The living spaces of the new Chilliwack homes at Cedar Springs Promontory will have gas fireplaces with a stone surround, gourmet kitchens, large bathrooms, 40 US gallon hot water tanks, crawl space and a black appliance package available. Ideally located adjacent to Garrison Crossing Chilliwack real estate development in Sardis, Miller Estates Chilliwack ranchers is an adult, master planned community featuring 17 luxury rancher style homes for sale. Finishing details at the pre-construction Chilliwack Miller Estates ranchers include engineered hardwood flooring, gas fireplace, barbecue outlet on the patio, plus fully fenced and landscaped yards. Pedestrian friendly, Miller Estates Chilliwack real estate development for adult living is just a short walk from Garrison Crossing’s new retail village where you’ll find restaurants, coffee shops, drug store, Cooper’s Foods and easy walking distance to the new Cheam Community Centre. 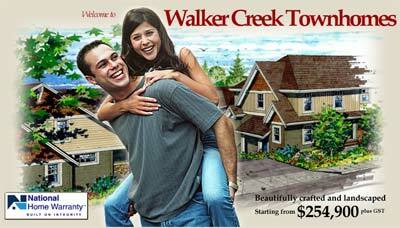 Some Miller Estates Chilliwack lots for sale include private RV parking and they start from just $359,900. For more information about the pre-construction Chilliwack Miller Estates homes, please call 604.858.7179 or visit www.millerestates.ca to book a viewing appointment today. For more Canada Retirement Communities, click here. Sardis real estate has never seen anything like this before! Welcome to Sardis Chilliwack’s newest gated adult community that introduces 17 new luxurious rancher homes to this master planned community. Best of all, the developer is now included the net GST with your purchase of a new Chilliwack rancher Miller Estates homes today for a limited time offer only. A home in Miller Estates Chilliwack ranchers is strategically located to everything that the Sardis real estate community has to offer. A lifestyle providing both comfort and luxury, the pre-construction Chilliwack homes for sale feature an adult gated community for retirees as a retirement home that is affordable and well situated in the Fraser Valley real estate market. Starting from just $359,900, the pre-sale Chilliwack Miller Estates Sardis homes are available through Re/Max NYDA Realty of Chilliwack so speak with Robert and the Miller Estates Marketing Team today for more information about this amazing retirement home community opportunity. Many of the Chilliwack retirement homes have already been sold, but the available Miller Estates Sardis ranchers range from $369,900 to $399,900 with GST included. Also, there are a number of Miller Estates Chilliwack ranchers that include RV Parking as well and the square footages range from 1327 to 1991 square feet in size. Close to nearby restaurants, shopping and activities, act now and visit the website to view The Newcastle virtual tour in addition to a photo image gallery of the interior and exterior. An impeccable retirement location is now available at the Sardis Chilliwack Miller Estate Ranchers that are across the street from the master planned Garrison Crossing community with its upcoming retail village that will include a wealth of services, stores, shopping and conveniences. Also at Garrison Crossing near the Sardis Miller Estates retirement homes in Chilliwack real estate market is the Cheam Community Centre, beautiful walkways, trails and many outdoor recreational pursuits and options for retired folks. A premier adult community development, the amenities on site and off are truly outstanding. Close to Garrison Crossing Chilliwack real estate community and within walking distance to grocers, banks and other services, you can also enjoy the scenic Rotary Trail System. Also, this gated Chilliwack adult oriented community provides security and comfort and is designed to last with quality construction and detailed craftsmanship. Some of the features of the Sardis Miller Estates Chilliwack retirement homes include nine foot ceilings on the main floor in addition to crown mouldings, vaulted ceilings in some homes, 30 year shingles, Smart Side Siding, maintenance free vinyl siding, stone and shingle gable exterior accents in addition to premium finishes. Also available at the pre-construction Chilliwack Miller Estates Sardis retirement homes include a rough in for an addition recreation room, bedroom or bathroom, insulation, security gated entry to the community, personal RV parking, gas furnace, central air con and hard wired smoke and carbon monoxide detectors. For more information about Garrison Crossing Chilliwack real estate development, please select this link. Here are some interior features of note: pre-wiring is all included, double vanity sinks, soaker tub with separate walk in showers, wrought iron spindles with maple railings in loft units and plush high grade premium carpets in the bedrooms. Also available at the new Chililwack homes for sale at the retirement Miller Estates community in Sardis near Garrison Crossing includes a premium light package, quality Moen plumbing fixtures, luxurious ensuite bathroom, oil rubbed bronze cabinet hardwoare, tiled back splash in the kitchen, cozy natural gas fireplace with hand stained marble surround and shaker style cabinetry. Also featured at the Sardis Miller Estates Chiliwack retirement homes include six panel colonial doors, ceramic tiling and engineered hardwood flooring. The quality exterior construction for the gated Chilliwack retirement ranchers at Miller Estates Sardis includes aluminum gutters, luminated carriage light, landscaped yard, insulated double garages with openers, Rain Screen technology, barbecue outlet on all patios, driveway and concrete patios. Sardis Chilliwack real estate’s newest gated retirement community is now here and the Miller Estates Ranchers are a perfect blend of tranquility and convenience. Strategically located adjacent to Garrison Crossing Chiliwack real estate development, preview the new Miller Estates Sardis Ranchers today or visit www.millerestates.ca for additional information or to download the marketing brochure. For those unfamiliar with the Greater Vancouver real estate market, ParkLane homes is one of the most trusted and well established builders in the property construction business, and they have just released the latest phase in their pre-construction Fort Langley real estate development at Bedford Landing Designer Series. The pre-sale Fort Langley home (detached single family) at Bedford Landing represent high-end houses along the waterfront property and start from $1.6 million dollars. Marketed as being the best value for Vancouver waterfront real estate, the Bedford Landing Designer Series of Fort Langley homes are now selling and there are only eleven opportunities to purchase. These riverfront homes for sale will range between four and five thousand approximate square feet (family sized) and are single family detached homes. The sales centre for the Fort Langley Bedford Landing Designer Series homes is located at 23015 Billy Brown Road and they are open Saturday and Sunday from noon to 5pm as well as by appointments any other time if you are looking for a viewing. New construction residences with the ultimate in interior detailing, finishes and features, these impressive luxury riverfront homes termed the Designer Series Bedford Landing houses will certainly impressive you with it’s location, amenities, features and craftsmanship. For more information about other ParkLane Designer Series Homes including Southport South Surrey and Port Moody Heritage Woods, click here. Situated on prime real estate in the best location of the master planned Bedford Landing project, the Designer Series Homes are certainly an impressive site. You will expect to find four, yes four, gas fireplaces in the homes (one of them is an exterior fireplace on the patio deck as an upgrade) as well as an art room under cathedral ceilings. In addition, the pre-sale Fort Langley homes at Bedford Landing Designer Series will include such things as custom millwork throughout, a wine room in the cellar, free standing tubs and separate showers in the ensuite bathrooms. Other awesome features for Fort Langley home buyers at Bedford Landing houses include open concept modern design with traditional features in addition to expansive rooms and flow-through indoor and outdoor living space to increase your entertainment space too. The main flooring on the main level is made of real hardwood and the tower design and architecture is very impressive. 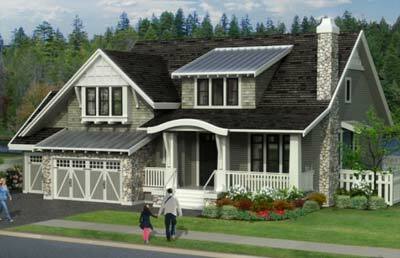 In addition the Designer Series at Bedford Landing Fort Langley homes for sale will feature craftsman exterior architecture with wood shingles, heritage style detailing and porches/side decks. For families that love gardening, these homes are awesome too. All of the Designer Series Bedford Landing homes for sale will have views of the river as well. 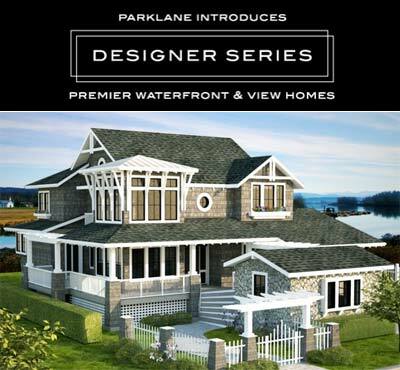 For more information about the ParkLane Designer Series homes that start from one and a half million dollars, please visit their corporate site at parklane.com and click through to the Bedford Landing sub-site. The interior design for the pre-construction Fort Langley homes is by Eye Three while the architecture was designed in house within ParkLane Homes themselves, who are also the developers. 11 riverfront homes are now available for purchase and move-in at Bedford Landing Designer Series, so why wait to buy your dream home at an affordable cost and low interest rates? Riverfront living in this historic town of Fort Langley is now affordable and available through ParkLane Designer Series homes where you’re literally at the river’s edge, with great water views, an excellent and peaceful location and a family oriented and safe neighbourhood. But the call of the water is one you’ll want to answer. You’ve heard the call of water inviting you to live on its shores – a call that many hear, but only a fortunate few can answer. Explore this rare opportunity to live in al uxury home of uncommon beauty, invest in a property or extraordinary value, and create a legacy for future generations to cherish here at the Bedford Landing Designer Series Homes now selling. The premier Fort Langley Bedford Landing waterfront homes start from just $1.6 million. Now open is the Designer Series show home at the Bedford Landing Fort Langley real estate development and with an outdoor fireplace, huge patios, elegance and charm, functional spaces and lots of storage, these premier family waterfront homes are truly nothing you have ever seen before in this area. The gourmet kitchens at the Designer Series Bedford Landing homes feature soft close cabinetry doors, two dishwasher drawers which are energy and water efficient, wall ovens for space conservation and better kitchen arrangement, as well as engineered stone counter tops that are long lasting and very durable. In addition, there are views of the Fraser River from multiple places here at the new Fort Langley Bedford Landing Designer Series Homes. The second floor features an impressively large master bedroom complete with a private balcony, fireplace with marble surround as well as an ensuite with a corner free standing soaker tub, dual vanities and two person shower too. The lower level of these presale Designer Series Fort Langley Bedford Landing homes for sale will feature a media room or den or office and the location is just impeccable as well. Close to the Fort to Fort Trail in addition to the waterfront areas, the Designer Series display home for the waterfront Bedford Landing homes for sale is now open at 23109 Muench Trail in Ft Langley. For more details about the master planned pre-construction Fort Langley real estate development at the riverfront Bedford Landing community, click on this link. Now is the time to move to Fort Langley real estate, with these 11 impressive lots available and custom built homes with four or five bedrooms designed to fit your every need and lifestyle. The Fort Langley Bedford Landing Designer Series homes will range from 4500 to 5000 square feet and begin in the mid $1.5 million dollar range, representing true waterfront real estate value and affordability. The Braemar house plan at Bedford Landing consists of a large detached family home with 4,954 square feet in interior living space over three floors. The four bedroom and den Designer Series ParkLane Home for sale will introduce a recreation open concept room downstairs with wet bar, fireplace, storage/utility room, media room, wine cellar and a fourth bedroom with full bathroom. The main living floor of the ParkLane Braemar Designer Series Bedford Landing home for sale will consist of a three car garage with direct entry into the main living space, entrance foyer, great room with fireplace, large kitchen with pantry, nook, separate den with wet bar, four patios, dining room, bedroom and powder room. Upstairs, the Braemar Bedford Landing house plan features the master bedroom with huge walk in closet, two balconies, two other bedrooms, library, huge ensuite bathroom with double sided fireplace, double vanities and free standing tub in addition to a asecond bathroom also with double vanities. The Bedford Landing Designer Series Startford house plan is just as impressive, but just slightly smaller at four thousand, five hundred and sixty eight square feet in size with 4 beds plus den. These is a completely separate dining room, and outdoor living space, covered porch and a guest room with bathroom on the main level. Close to everything and away from it all. A private oasis with urban spaces, fresh air, a fresh atmosphere and beautiful night skies and nightlife are waiting for you at the presales Anmore Pinnacle Ridge homesites and view lots for sale. 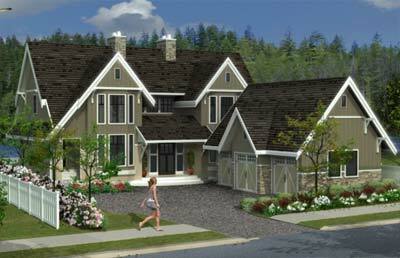 Have it all and build your dream home at this Anmore real estate home site release today. About the New Anmore Pinnacle Ridge Project - According to their online marketing: Pinnacle Ridge is a new real estate development featuring fifty five one acre lots with panoramic western views of the Burard Inlet, Indian Arm, Vancouver and the coastal mountains. Featuring Anmore real estate’s latest and newest Anmore view lots, homesites and acreage for sale in this prestigious lifestyles community with semi rural living spaces and convenient access to urban conveniences, the Pinnacle Ridge acreage views in Anmore are bound to be very popular amongst homebuyers who appreciate spectacular views, unparalleled location and custom built homes. This very special Pinnacle Ridge Anmore acreage and view lots development sits on a hillside rising 1500 feet to its peak and features western panoramic views beyond anything you have ever imagined. Phase One of the Anmore Pinnacle Ridge Acreage Lots for sale have released a total of 8 one care lots are remaining and they will be completing this fall 2008. Pinnacle Ridge Lots for Sale have a western orientation giving residents maximum daily sun exposure to complement their spectacular views throughout the day. The Anmore Pinnacle Ridge real estate development will provide an artistic and visually appealing experience for the residents of the community by building several creative and eye-catching features throughout the hillside property. The Anmore property development features several parks, and walkways leading to the top where residents of Pinnacle Ridge can walk the forested upper trails. Design guidelines for the presale Anmore Pinnacle Ridge homesites for the development community are intended to ensure consistent architectrural and landscape design quality throughout. There is a PDF download for more information about the acreage and view lots for sale in Phase 1 and subsequent releases of the Anmore presales Pinnacle Ridge homesites. The Civic Engineers for Pinnacle Ridge is MMM Group while the geotechnical engineers is EBA Engineering Consultants Ltd. the storm water management engineers include Dayton & Knight and the landscape architects is DMG landscape Architects, assembling the highest profile real estate development team ever in the city of Anmore. The technical site plan for the homesites and view lots at the Pinnacle Ridge Anmore development is online at http://www.thepinnacleridge.com/downloads/siteplan.pdf while the comprehensive design guidelines are also available for download online at http://www.thepinnacleridge.com/downloads/designguidelines.pdf. By visiting their marketing web site, you can also find out more about the Anmore Pinnacle Ridge sales process including terms, the purchase agreement, Schedules A, B, C, lot pricing and availability as well as the Pinnacle Ridge Lot Map (all downloadable PDF documents). An impressive virtual tour of the acreage with views are available at http://pixilink.com/tours1/pinnacle_ridge/. For more information online, you can visit www.ThePinnacleRidge.com. The Pinnacle Ridge offices is at 458 Southborough Drive in West Vancouver BC. You can call 604.925.0905 or email living@thepinnacleridge.com for more information and availabilities of the view acreage lots at Pinnacle Ridge Anmore real estate community today. According to the new Pinnacle Ridge Anmore real estate home site marketing: Anmore is a semi-rural community located on the western shore of the Burard Inlet offering upscale country living with convenient access to urban amenities. The Anmore real estate community boasts of magnificent natural beauty, including panoramic water and mountain views, woodland trails, forests and waterfront parks, and two pristine freshwater lakes with beautiful sandy beaches. Anmore is a great place to come home to. With a plethora of recreation, schools, shopping, entertainment, hospitals, transportation routes, and upscale neighbouring communities, Anmore real estate is on the rise and a perfect location to start a family or retire to. Anmore is home to panoramic mountain vistas, pristine freshwater lakes, woodland trails, parks and inspiring natural beauty. Anmore offers year-round outdoor and indoor recreational facilities and activities for all lifestyles. Anmore is also neighbours with Port Moody, the City of the Arts. Classic Beauty, West Coast Contemporary – Sophisticated, unabashedly classy, and boasting the irresistible charm of Boston Brownstone row homes, The Brownstones by Adera is locate din the heart of South Surrey real estate’s most popular Morgan Heights neighbourhood, directly across the street from the new village centre. A true urban flavour, alone in the serenity of the suburbs, the look is unique in this South Surrey real estate marketplace – brick cladding, stone accents and brick porches with classic architectural detailing. It’s a lifestyle design here at the South Surrey Brownstone row homes that is as perfect for professionals as is it is for young families. Celebrating Outdoor Style – no question about it, we West Coasters love the great outdoors. Every pre-sale South Surrey Brownstones row home comes with its own private rooftop view terrace where you can relax with the morning paper and a cuppa joe, savour a dinner al fresco, or simply watch the glories of a starlit summer evening. With up to 500 square feet to enjoy, these spaces at the Brownstones South Surrey rowhomes give a whoel new meaning to the concept of four season outdoor living. You’ve got to see the displays! And when you’re ready to explore, there’s a smorgasbord of activities to discover. From hiking, beachcoming, and canoeing to golf, baseball or swimming, your toughest choice will likely be where to start at the South Surrey Brownstones by Adera. The highlights of this South Surrey real estate development at the Brownstones Row Homes includes: spacious roof top decks with views, across street from Morgan Crossing, South Surrey real estate’s newest urban core, just steps to highly acclaimed Southridge Private School and proposed new Morgan Heights elementary, Built GREEN Gold for environmental responsibility and sustainable benefits, and one of the most successful projects in the South Surrey real estate district. Refreshing and unique, Salus is Surrey real estate’s most talked about new condo community, a complete wellness centre and resort al lin one. No need to travel to Whistler to have a true spa experience – you’ll be able to enjoy it right here at home. 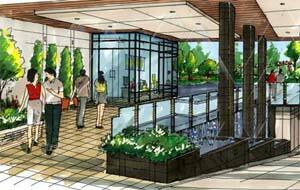 The Surrey Salus community heart and sould is Club Aqua that overlooks Salus condos’ main water feature. Here you can swim a few laps in the outdoor pool, soak luxuriously in the covered outdoor hot tub, or sweat away stress in either the sauna or aroma steam room. Check out the lavishly appointed Salus Surrey entertainment room that opens onto a 3500 square foot rooftop deck or chill out in the lounge with its incredible fireplace. Spectacular architecture at the new Surrey Salus apartments for sale. Drawing inspiration from the surrounding mountains forests, the architecture is strong Coastal Mountain, with massive timber beams, natural rock, cedar shingles, and angled rooflines. Interior finishings are exquisite, and the Salus Surrey community’s extensive trail system makes your morning jog or evening stroll a new adventure every time. A broad range of Salus condo floor plans ranging from trendy Salus flats to traditional Salus cityhomes mean there’s something to suit every lifestyle. And just in case all this isn’t enouh, Salus Surrey homes will alos have 24 hour resident concierge. Life just go even easier. The Highlights of the Salus by Adera Surrey condo development include: full range of professionally managed spa services in the Aqua Club, 24 hour on site concierge services, Easy access to transportation and SkyTrain, minutes from a broad array of shopping, dining, and services along the Scott Road Corridor and Built GREEN Gold status. The Gold Nugget Award has been given to Adera’s spectacular spa style master planned community of Salus Surrey which was named the Outstanding Attached Project (mid-rise) for 2009. Located at Scott Road and 66th Ave in Surrey real estate market, the Adera Salus condo properties is a collection of 238 apartment flats for sale as well as 160 city homes enclosing acres of gardens with interconnected ponds, trees and pedestrian walking trails. But it’s also Club Aqua at Salus Surrey real estate property, the onsite spa, that truly differentiates this community from all others. Sustainable amenity building and fourteen spectacular new homes at Salus Surrey apartment condos now open for viewing with uge savings from only $199,900 for a limited time offer (see sales staff for details). This is your last chance to own at the pre-sale Surrey Salus apartment condominiums as all finished homes will be sold out soon with immediate occupancy. 50% sold out at the grand opening with only 19 homes left in early July 2009. It’s the first multi-family residence in British Columbia to achieve Gold Built GREEN status. It’s called Burnaby GREEN, but that’s far more than just a name, it’s a philosophy at this new Burnaby real estate development. Located just steps from the lush, forested slopes of Byrne Creek Ravine Park, a 80 acre natural preserve that’s criss-crossed with trails and hoe to an active salmon spawning groun, this exciting collection of South Burnaby Green condo homes is an organic alternative to conventional residential home construction. 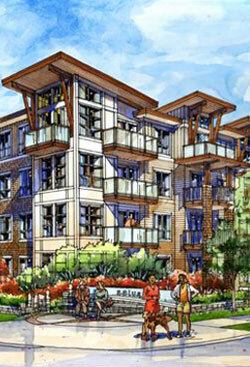 Sustainable Lifestyle achieved at the GREEN Burnaby apartments for sale. 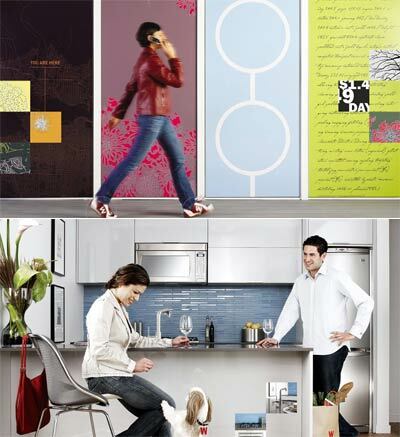 Every detail, every state of the art feature is meticulously designed to reduce GREEN Burnaby condo’s eco footprint. From sleek and secy motion activated kitchen faucets and low VOC paints to Energy Star appliances and lifetime membership in the Cooperative Auto Network, GREEN Burnaby condos is all about living life well. And because we believe your new green condo home should also be an oasis, we’ve designed GREEN with lavish, verdant landscaping. Courtyards, cascading waterfalls, sparkling ponds, and walking pathways combine to create a peaceful trnquillity rarely found in te midst of a large city. The highlights of the new Burnaby green condos for sale include: only minutes from SkyTrain, Byrne Creek Ravine Park, Riverway Gold Course, major shopping and dining close by at Market Crossing and Big Bend Shopping Centres, GREEN Season’s Club with spa inspired amenities including fireside lounge, gym, yoga room, infrared spa, games room and entertainment decks, 24 hour on site concierge services and Built GREEN Golf for environmental responsibility and sustainability. Inspired Lifestyle – Imagine Pacific Spirit Regional Park as your backyard, UBC as your neighbour, and a sizzlingly sophisticated, environmentally savvy, Pacific Spirit UBC condominium residence to call home. This unique UBC real estate opportunity could be yours at Pacific Spirit. Located in the heart of Wesbrook Mall, UBC’s dazzling new master planned neighbourhood, Pacific Spirit UBC apartments by Adera is where active lifestyles, education, tranquility, and culture merge. An inspired, artistic blend of natural materials, generous outdoor spaces, and stellar interiors. Pacific Spirit UBC condos for sale is where all these qualities come together in nature to create a residence y ou’ll love to come home to and proud to invite your friends to. The highlights of the UBC Pacific Spirit condos for sale include: Built to Gold REAP standards, solar hot water preheating, Co-Op Cars, and numerous other green condo features, in addition to rare opportunity to savour an environment of mental agility and creativity.